Restorative dentistry is defined as the prevention, diagnosis and treatment of oral diseases, the teeth and supporting structures. Dentists who specialize in restorative dentistry basically rehab your teeth. They determine what the problems are, the best materials that can be used to fix the problem teeth and the best method to do so. Restorative dentistry requires the skills of multiple dental specialties working together to solve complex problems. What Can Restorative Dentists Do for Me? Restorative dentists can do a lot for you. You are probably most familiar with cavities in your teeth. These used to be routinely treated with silver or gold fillings, but now there are a host of other options available that will help to make the filling material to match your teeth. You’re probably familiar with crowns as well. Crowns have been around a long time and are used to cover and protect teeth that have deteriorated past the point of a filling, but have enough dental area left to support a crown, It’s simply a cap that fits over your tooth replacing the structure that is lost by utilizing the structure that remains. 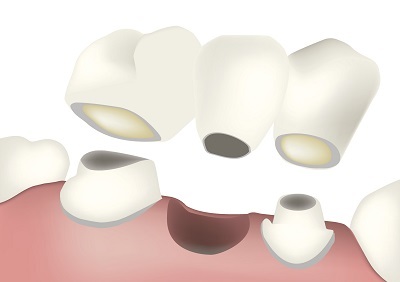 Restorative dentists can construct bridges that are appliances that fit between the teeth to replace a missing tooth. These devices can be permanent or can be removable. What your dentist does will depend on the teeth that are adjacent to the missing tooth. If these structures are stable you may be a candidate for a fixed bridge that you don’t have to remove. Implants are also an option for a restorative dentist to use. If you have a missing tooth, the dentist can install a post that screws into your jaw. This post becomes the base for the crown that is placed over it. The crown is made to match the color of your teeth and is a permanent solution. If all else fails and your teeth are in such bad shape that they simply can’t be saved the restorative dentist can make dentures for you. These can be a complete set, for all of your teeth, a partial denture that just replaces some of your teeth. The partial denture is held in place with clips on your natural teeth. If you need restorative work contact our office. We will work with you to get your problems solved.